(PhysOrg.com) -- Australian scientists have reported the first known detrimental impact of southern hemisphere ocean warming on a fish species. The findings of a study published today in Nature Climate Change indicate negative effects on the growth of a long-lived south-east Australian and New Zealand inshore species  the banded morwong. Scientific monitoring since 1944 by CSIRO at Maria Island, off the east coast of Tasmania, showed that surface water temperatures in the Tasman Sea have risen by nearly 2°C over the past 60 years. This warming, one of the most rapid in the southern hemisphere oceans, is due to globally increasing sea-surface temperatures and local effects caused by southward extension of the East Australian Current. Generally, cold-blooded animals respond to warming conditions by increasing growth rates as temperatures rise, CSIRO marine ecologist Dr Ron Thresher, a co-author of the study with colleagues from the University of Tasmanias Institute for Marine and Antarctic Studies, said. But theory and laboratory studies show that this has a limit. As temperatures get too high, we begin to see increased signs of stress, possibly eventually leading to death. We are looking at whether climate change is beginning to push fish past their physiological limits. By examining growth across a range that species inhabit, we found evidence of both slowing growth and increased physiological stress as higher temperatures impose a higher metabolic cost on fish at the warm edge of the range. Dr Thresher said climate change can affect species directly by influencing how their bodies function, their growth and behaviour and indirectly through environmental effects on ecosystems. To assess the impacts of this temperature increase on a marine species, the research team analysed long-term changes in the growth rates of the banded morwong (Cheilodactylus spectabilis). The bony structures fish use for orientation and detection of movement  called otoliths  have annual growth rings which were measured for changes. Similar to growth rings in trees, they can be counted to indicate a fishs age and annual growth rate, estimated by measuring distances between each new ring. According to a co-author of the paper, University of Tasmania (UTas) researcher Dr Jeremy Lyle, banded morwong were used in the study because they can live for almost 100 years and, as adults, they stay in essentially the same area even if the water temperature shifts. They have also been the subject of fisheries studies conducted by UTas researchers. Growth rates of young adult banded morwong in SE Australia have increased significantly since 1910 at four sample sites, Dr Lyle said. The team from CSIRO and the Institute for Marine and Antarctic Studies (UTas) compared these changes to temperature trends across the species distribution. They observed increased growth for populations in the middle of the species range in Australian waters where temperatures have increased, but are still relatively cool, but growth slowed with rising temperatures at the warmer northern edge of the species range in New Zealand waters. 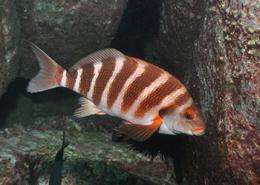 Dr Lyle said the study showed that growth performance in banded morwong began to suffer above average annual water temperatures of about 17°C. Can marine life adapt to global change?